Earlier this year, we were reading the book Charlie and the Chocolate Factory. I like to come up with corresponding activities to go along with our book studies in the hopes that it will cement the learning and usually come up with a sensory bin as part of that. 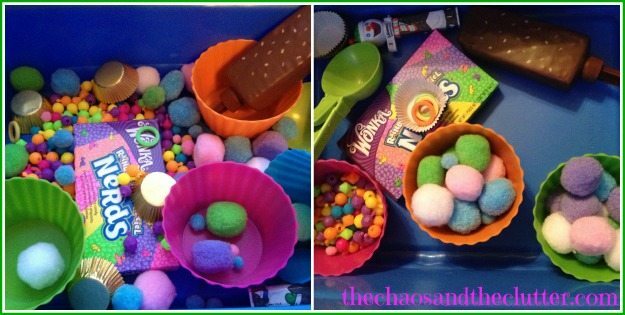 It seemed only natural that a Candy Sensory Bin should go with Charlie and the Chocolate Factory! I included various sizes of pompoms, little beads that can be strung together to make a necklace that looked candy-like, gold foil bon bon cups to represent the Golden Tickets, an empty Wonka Nerds box, an ice cream scoop, a Pez candy dispenser, ice cream bowls in bright colours, a Fudgesicle bubble blower which was chocolate scented, and the little rings that you can put on keys to tell them apart (which I bought for $0.99 for a pack of 4 and thought they looked like Life Savers and they have great sensory elements to them). At one point, I bought a pack of Wonka Gobstoppers and ate them so that we could use them in the bin (the sacrifices I make for my kids!) but the empty box likely got thrown away so I bought another box and with that one, I shared them with the kids, but that empty box also somehow got thrown away so after two failed tries, I gave up on having Gobstoppers in the candy sensory tub! It was neat to see how differently the kids approached playing with this bin. Some got in there and smelled everything, mixed things all around, made a necklace out of the beads and wore it while they played, while others were more methodical in their approach and separated things by colour or just organized the bin in the way they felt best. I didn’t disassemble this bin because I’m planning to pull it out again for Valentine’s Day week and will add some plastic conversation hearts to it for that. 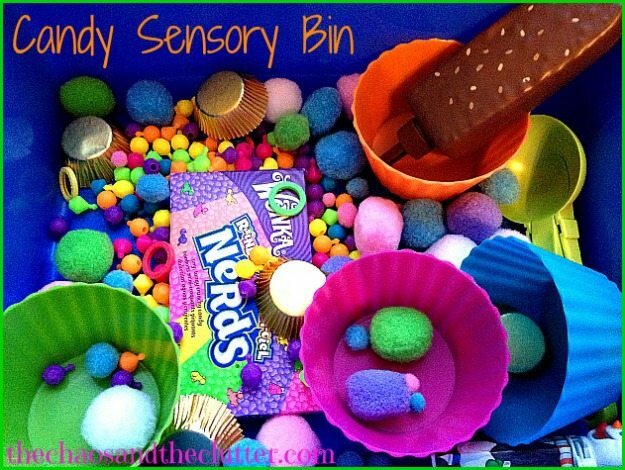 Double-duty sensory bin! What a neat bin idea! When I first saw “Candy Sensory Bin” I thought…how on earth do you fill a bin with candy and not have the kids eat it all! lol I love that it’s going to pull double duty too.